And so we reach the end……..
We arrived in viareggio at 0300hrs this morning after what felt like going thruogh the washing machine, I have never seen so much spray! I had the wipers on full and still they would not clear the water, it was just solid. then the Stb wiper seized and the port one failed…great! out on deck in that lot! But alls well, and once agin magellano came through. i will not pretend that this cruise has been easy, or even at times enjoyable ( like when you have your head in the bilge at 4am rolling and pitching thru 30 degrees), but it has done a few things…. Obviously all the clients and guests, but especially, Frank & Fiona Walker, It was really very nice to talk to you both and discuss the merits and pitfalls of all things boaty. Heinz-Harald Frentzen, again very nice to meet you and to chat with you about CARS! Good luck wqith the Gumpert, I know a good home for the BCY RS6 engine you have…. Mr Missoni, Thank you for the clothing you supplied and making Magellano even more stylish- sorry we couldn’t catch you a fish! To the Agents- all of which have been fantastic and too numerous to name all individually, but special thanks to Heny, Jaques and assc. in Sidi Bou Said- the party was wonderful, you truly looked after us as if we were royalty- and thanks for the medicine! Nikki in Malta and his team. 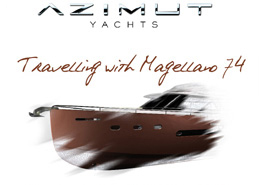 fantastic support, and a dealership/agent of which azimut must be very proud. “Capitano di Magellano, Dagellano” Dag. An honour and privilidge to sail with you- you have definately not lost it buddy, and the leaving of Portomaso was some of the finest seamanship skills I have ever seen. Marco Tomei. The nicest man I have ever met. (and the funniest one liners ever.) a true seaman and a true friend. 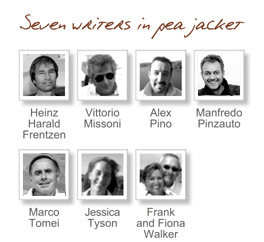 Manfredo P. not a sailor, but the best photographer i have met. Again an integral part of our team, Magellano seemed empty with you gone. a bit missing. take care and good luck. Enzo…… although you did not join us in person- you were with us in spirit. Good luck for the future and your soon to be fatherhood. To Azimut: thank you all for allowing me to be involved with this project. It was an honour. and Finally to Magellano herself. 2000 miles you carried us, yes we had problems, but they wern’t your doing…..and we arrived safe and sound, thanks to you…..